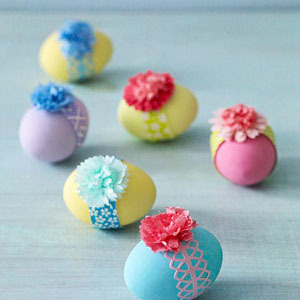 After looking on Pinterest today, I found a plethora of great Easter egg decorating ideas. Here’s my top 10. Oh and before we start, here’s how to make the perfect hard boiled egg use 5 day old eggs! 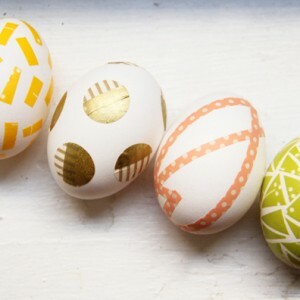 #10 – Use rubber bands of various sizes to create white bands in your eggs. I think this looks so classy and is so easy! Idea came from this site. 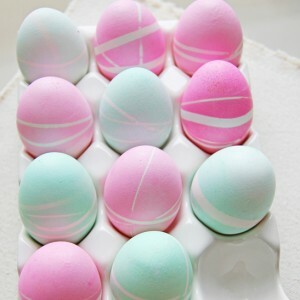 #9 – You will find step by step instructions on how to make tie dyed eggs here on this site using neon food coloring. My oldest daughter loved tie dye, so I think she will want to use this method! #8 – I think this tissue paper method is such a great way for little ones to feel involved in the easter egg decorating process and it’s beautiful too. I think you could experiment with the shapes and make really fun designs. 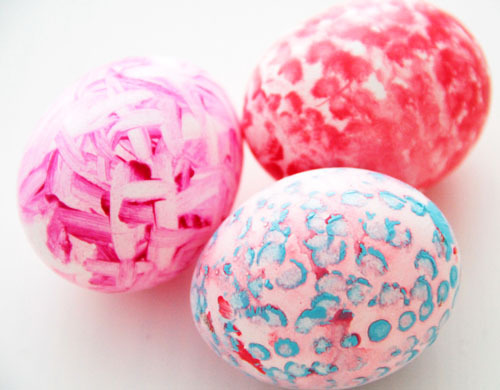 #7 – Use q tips dipped in acrylic paint (found for $1 or less at craft stores) to “paint” eggs after they have been dyed a base color. This looks so easy! We already have a bunch of acrylic paint, so this might be a good choice for us. Click here for more information. 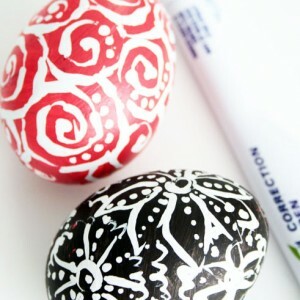 #6 –This site has some great Easter egg decorating ideas using pens. How creative! I have an artist in my family that I think would really like this creative process. I’m not sure if it would be safe to eat the eggs after using pens on them, so please check that out before consuming them. #5 – I totally fell in love with these little beauties from Family Circle Magazine. They are so easy. You just using small strips of origami paper and small flowers. I think paper doilies would also work nicely on this design. Do you think so? 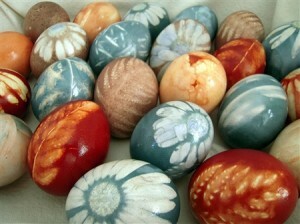 #4 – Of course Design Mom has lovely photos of her making vibrant eggs (and lots of other beautiful eggs too). Also, check out this site for the actual dying instructions for vibrant eggs. 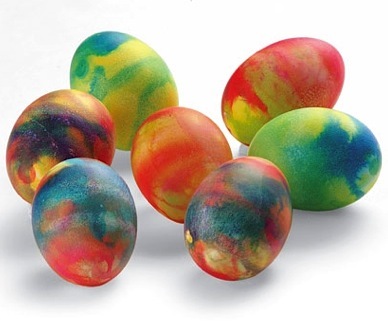 #3 – If you want to wax very creative and are doing egg dying with older kids or adults, you can try this natural food dye technique. I love love love the results using real flowers and leaves and that no boring color tablets were used in this design! This one is a little more time consuming, but I think it would make for a really memorable experience for the family and the eggs are just absolutely stunning! 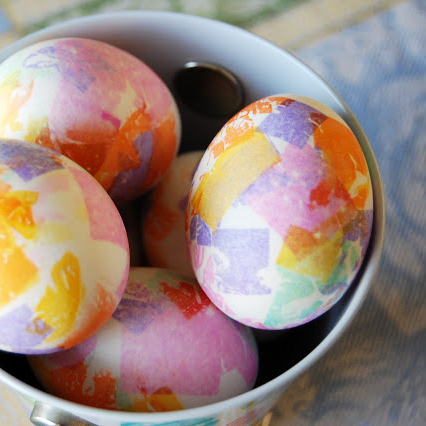 #2 – These eggs were decorated using washi tape. I don’t have any washi tape yet, but I think I need to get some! You can find lace tape here and bright colors here. I think the lace would look nice on the eggs above that have the flower in the center and the origami paper middle. I can think of a lot of craft projects I could use washi tape on, and this one doesn’t look like it uses much, so I could have some leftovers for other things. Sounds like a great plan! #1 – I must confess, even though it’s probably quite messy, I’ve always wanted to do glitter eggs with my girls. ALWAYS! This is the year I’m going to do it. I even bought superfine glitter so that I could not have an excuse to do something else this year. 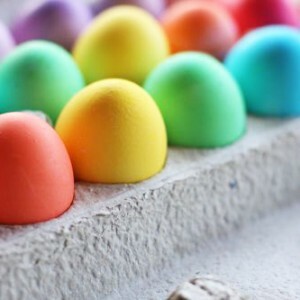 You must dye the eggs first and then use thinned glue and glitter to intensify the color. 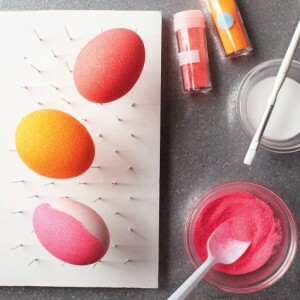 I like Martha Stewart’s little contraption made from foam board and straight pins for help in making the perfect glittered egg. What will you do for Easter this year? Please share with us by posting a comment! Well, here’s to hoping you have a much better Easter this year! Hey! My 13 year old is really crafty she always loves DIYs she finds. For Easter my son was sick! It was awful! So he had to stay inside and not go Easter egg hunting! My 2 older daughters felt terrible! I felt bad! So my daughters made Ninja turtle Eggs, with him during Easter it made him feel better! They even made cute Easter eggs for our neighbor! We live in Spencer Ma.